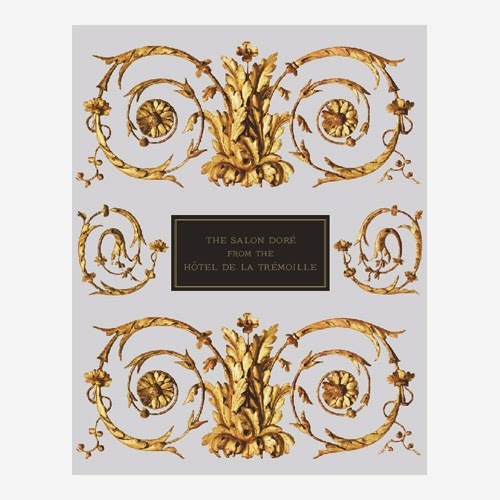 The Salon Doré will be unveiled to the public on April 5, 2014, after a series of celebrations honoring the very very generous patrons who supported, advised, encouraged, and generously donated to make this world-class room happen. The Legion of Honor museum is part of the Fine Arts Museums of San Francisco, and a rich part of the heritage of the City. 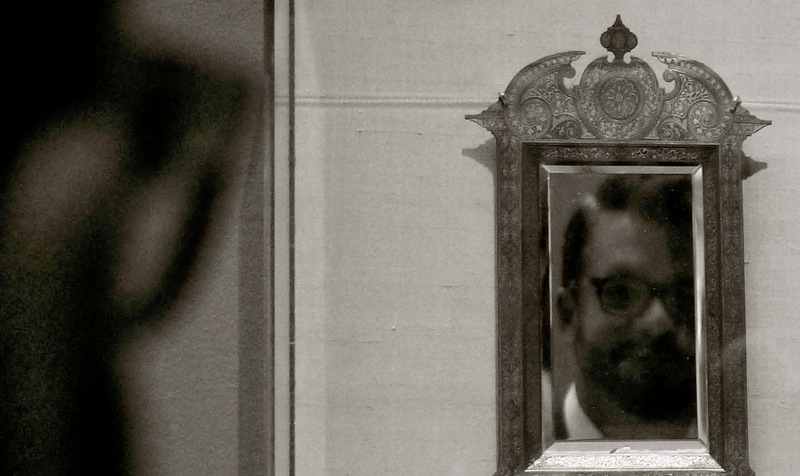 It is important to note that his is a public museum—and a treasure of San Francisco. 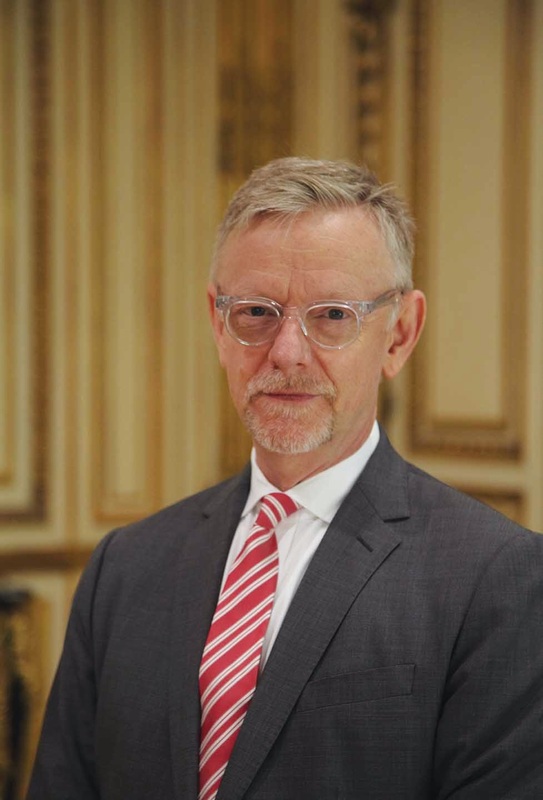 This week I am delighted to hand over the reins and introduce the great antiques and fine arts specialist Philip Bewley who is the guest editor for this vibrant piece about the restored Salon Doré, and the Legion of Honor Museum in San Francisco. 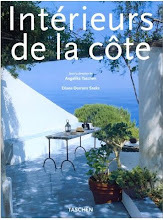 I’d suggest that you might wish to pour a flute of bubbly (Billecart-Salmon, perhaps, or JCB by the great Jean-Charles Boisset would be celebratory) or a sip of iced mint tisane (very French very seasonal) and come and enjoy this vivid and beautiful story. 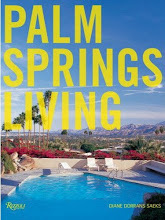 It is a highly detailed story, and endlessly fascinating and ‘insider’. Read this informative text—and then buy tickets online, and take a friend to view the room. Philip Bewley will be your guide. 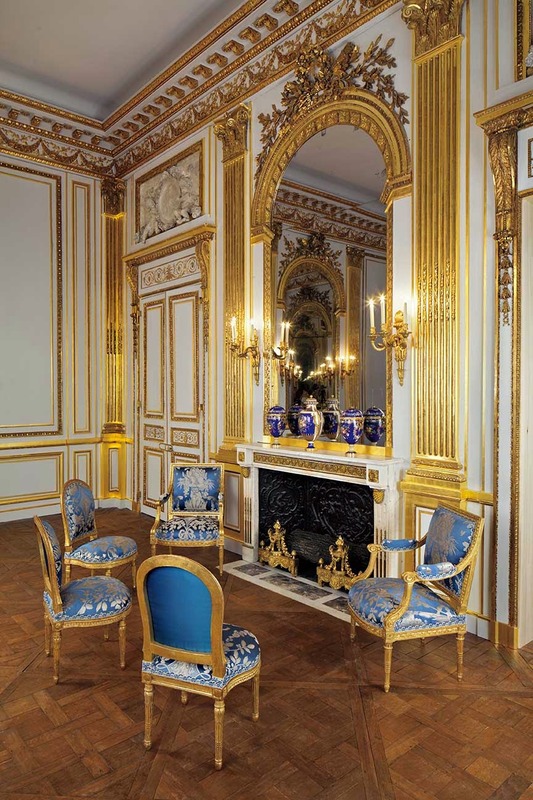 Philip, a longtime friend, has been following this multi-year restoration of the museum’s treasured eighteenth-century Paris room (from a famous mansion) and I asked him to write this piece. Philip interviewed the museum curator, Martin Chapman, who directed the renovation. He spoke with the San Francisco architect Andrew Skurman, who worked on the project, and had the privilege of special viewings of the room in progress. I’ve also selected images of the work in progress. Finally, last week he saw the completed restoration in all its glory. Philip’s report is exclusive to THE STYLE SALONISTE. 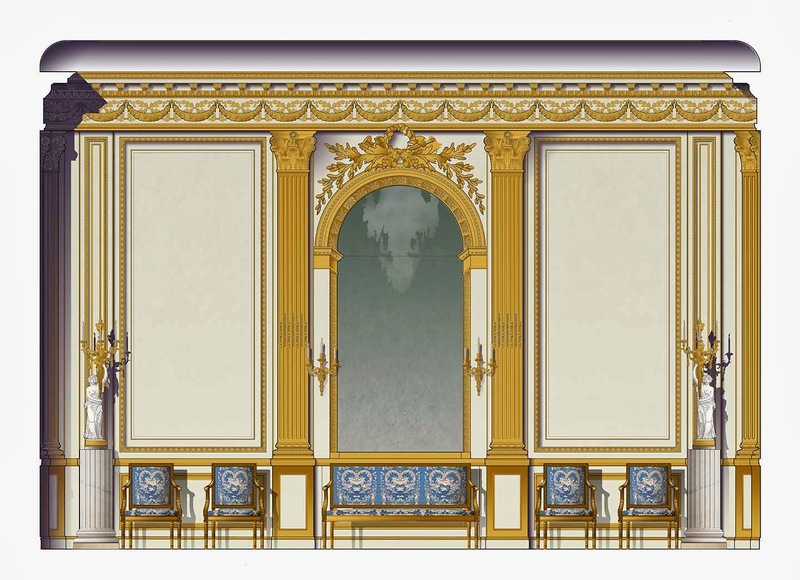 The Fine Arts Museums presents ‘The Salon Doré Past and Present’ — the re-opening of the Salon Doré one of the finest examples of French Neoclassical interior architecture. 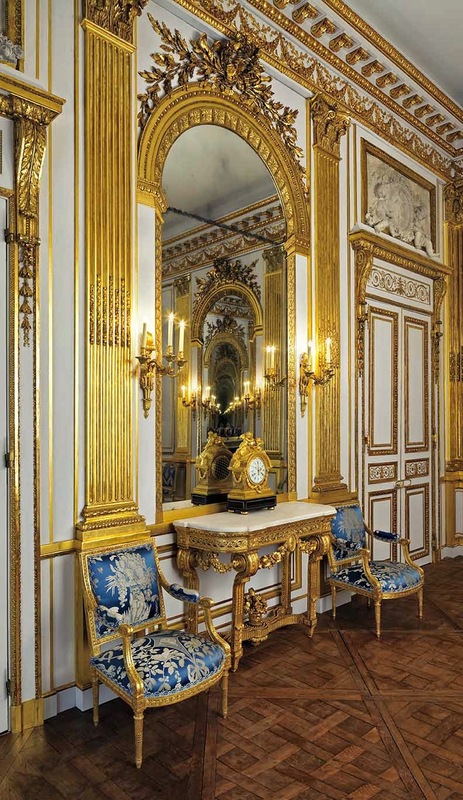 Richly carved and gilded, this lavish room was designed during the reign of Louis XVI as the main salon de compagnie of the Hôtel de La Trémoille on the Rue Saint-Dominique in Paris. 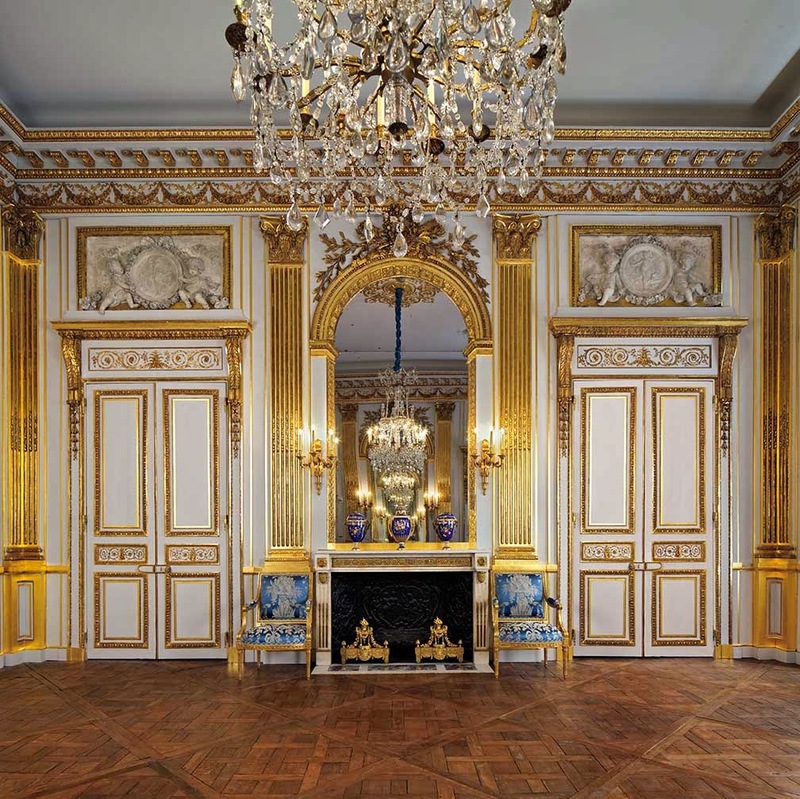 I was fortunate to be given an insider preview of one of the finest examples of an eighteenth-century French Neoclassic period room: the Salon Doré from the Hôtel de La Trémoille now completely restored and refurbished to its former glory at San Francisco’s Legion of Honor. 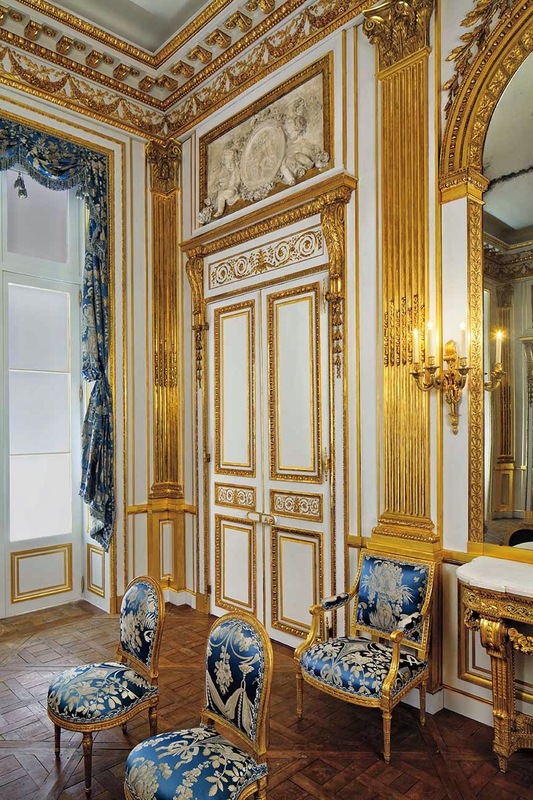 The restored Salon Doré sets a new standard of presenting period rooms in a museum setting. 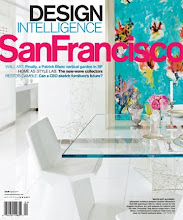 Philip Bewley, San Francisco fine arts consultant and antiques expert tells us about his private preview. 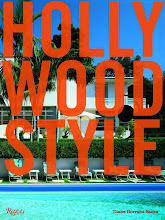 He interviewed world-renowned experts, exclusively for THE STYLE SALONISTE. After years of study, research, painstaking restoration by world-class experts, the generous support of highly generous patrons –and the supreme vision of curator Martin Chapman -the Salon Doré is unveiled. PHILIP BEWLEY IS HERE TO TELL US ALL ABOUT HIS VISIT, THE PROCESS, THE HISTORY, THE ANTIQUES, THE GLORY AND THE BEAUTY. I was very fortunate to have a view of the restored Salon last week before its opening to the public, and the Salon Doré is dazzling. The experience far exceeded my already high expectations. Upon entering the octagonal anteroom I felt a sense of anticipation, a palpable sense that I had left not only the museum, but also the present day behind. 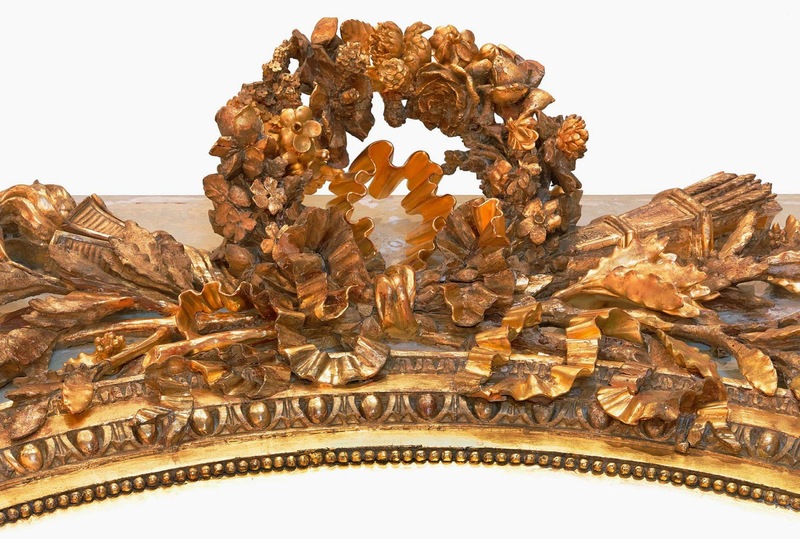 To one side is one of the great treasures of the Legion of Honor , a superb Louis XVI transitional commode composed of Japanese black lacquer and panels enriched by gilt bronze mounts. 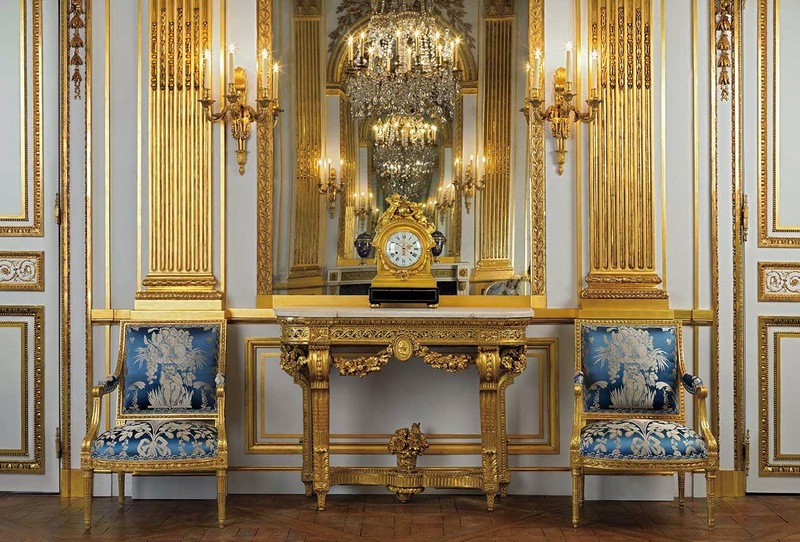 Previously dwarfed by its placement in the expansive museum galleries, now, in this jewel box of a room, the commode replicates the small apartments of Madame du Barry where it had originally been installed in the 18th century. The restored room is a potent example of the power of classical proportion. The experience of inhabiting a perfectly proportioned room is almost inexplicable, but perhaps it is the exhilarating sense of “rightness” that I felt immediately. At once grand and soaring, and yet surprisingly intimate, the Salon is the ideal room for conversation. 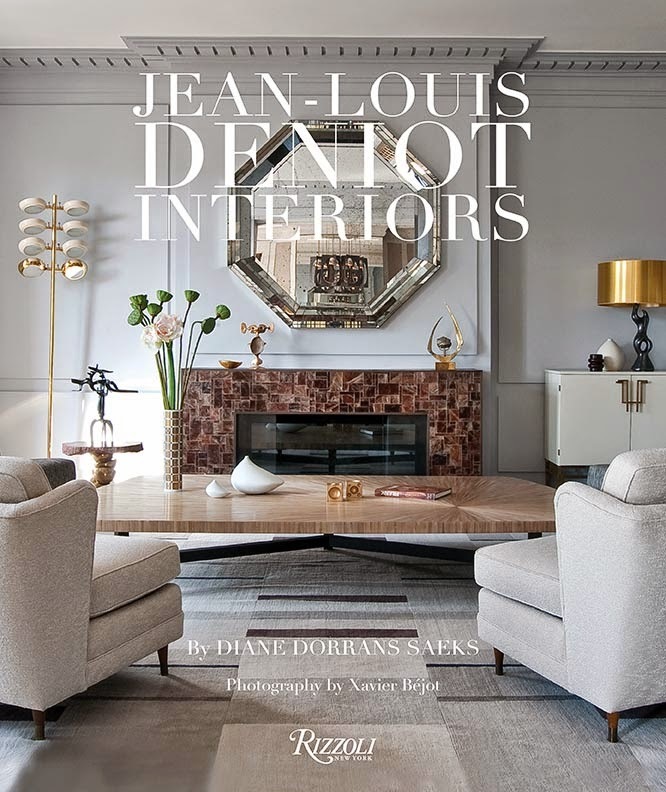 It is this magical combination of spatial shape and harmonious proportion that has captivated classical architects for centuries, and the Salon Doré captures this elusive quality. This is how the room looked in Paris, installed in a private room. Everything is now balanced: the vast mirrors, darkly glimmering in the gentle light, afforded me views of other areas of the Salon in a compound rhythm; reflections of the vigorous fluted pilasters, the figural reliefs of the plaster overdoors, a glint of light from gilt on the boiserie. The furnishings in this setting brought the pieces to life, relating to each other in recreating a total entity and ambiance. 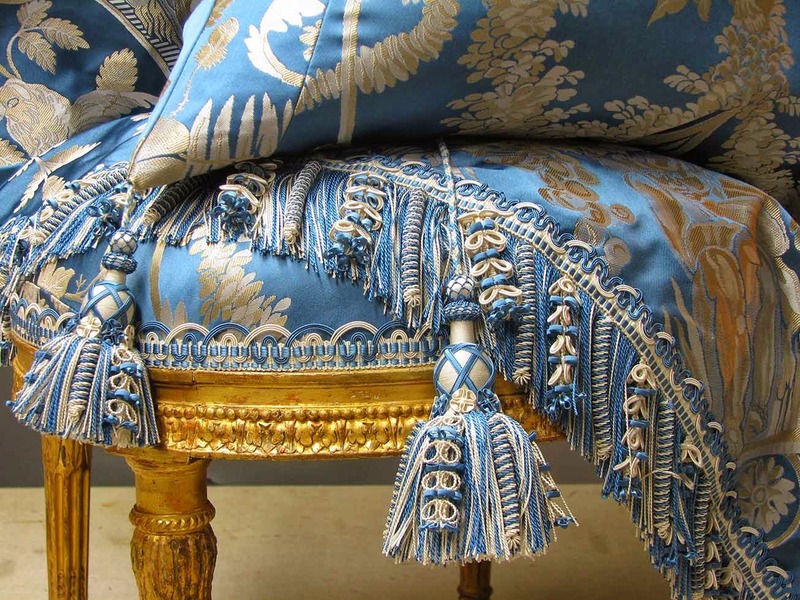 Here are the torchères on their plinths, the chairs by Jacob, the curtains of rich silk expressly fashioned in the authentic 18th century manner. Experiencing the Salon is compelling and immersive. As my eye took in all the various details, I felt I had entered into a rarefied “other” space possessing a distinct glamour –and it is heady and elevating. The evocative ambiance of Ancien Regime (pre-revolutionary) Paris meets the rigorous research and perfected conservation techniques of the 21st century. The restored proportions, boiserie (paneling), atmospheric lighting and furnishings, enliven the room. For history, architecture and design students it is instructive, vibrant, and relevant. 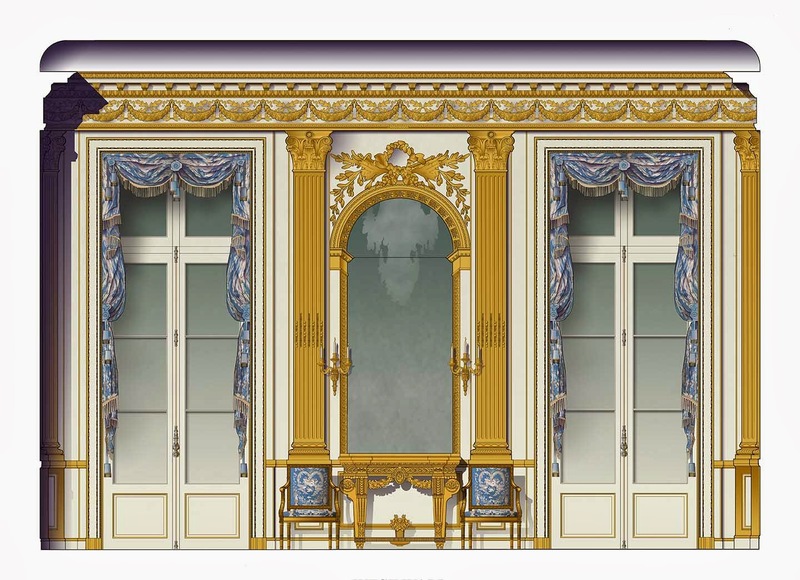 The Salon Doré will be unveiled to the public on April 5, 2014. It is the result of years of repair, reconstruction, craftsmanship and determination. The newly restored San Francisco salon is the result of exhaustive research, significant discoveries, a re-instatement of missing elements, and a treasure trove of furnishings. 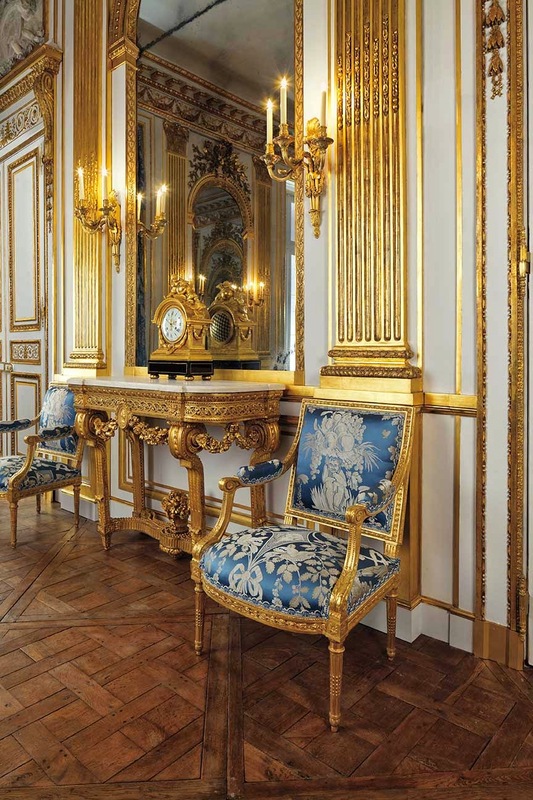 Research uncovered that the Salon Doré was a salon de compagnie, the principal reception room at the Hôtel de La Trémoille, a private mansion in Paris belonging to one of the oldest families of France. The room was first installed in 1781 on the occasion of the wedding of the eldest son, the prince de Tarante, to Mademoiselle de Châtillon. 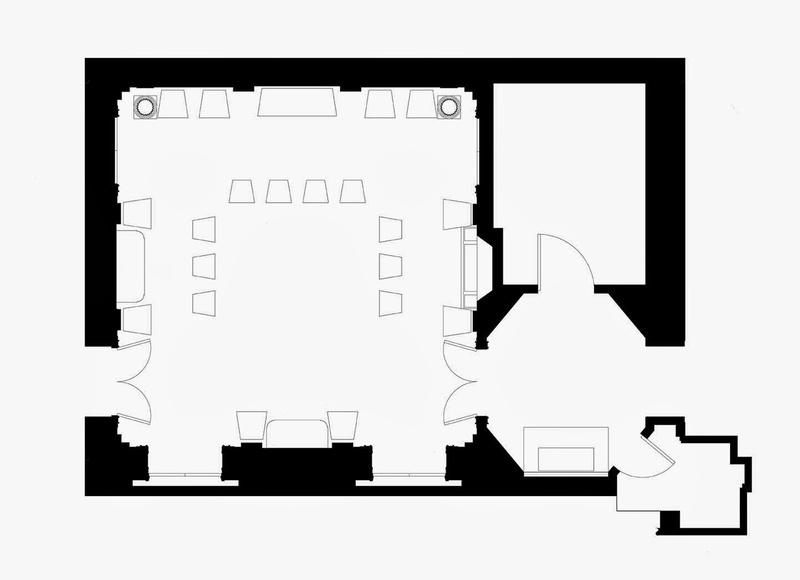 Based on the original floor plans, the room has been returned from a rectangular to a square layout – the conventional form of an aristocratic salon. The measured splendor is the highest reflection of the goût grec or Neoclassic taste, the use of mirrors, rock-crystal chandeliers and gilt in a classical framework to achieve, what the 18th century art historian and aesthete Johann Winkelmann (1717-1768) described as “ideal beauty…of noble simplicity and quiet grandeur." The Salon’s original color scheme of pale grey paint and parcel gilt boiserie is now gently illuminated, giving the impression of candlelight. The Salon presents its full complement of 18th century mercury backed mirrors fitted in the boiserie. These provide seemingly infinite reflections placed opposite each other, and further enhance the illumination. These mirrors were originally the most costly items of to be incorporated in the salon, and the rather dark, rich, almost liquid effect enhanced by the iridescence of 18th century mercury plate cannot be underestimated. One of the mercury plate-glass was missing, and a replacement of a contemporary “antiqued” mirror proved unsatisfactory. 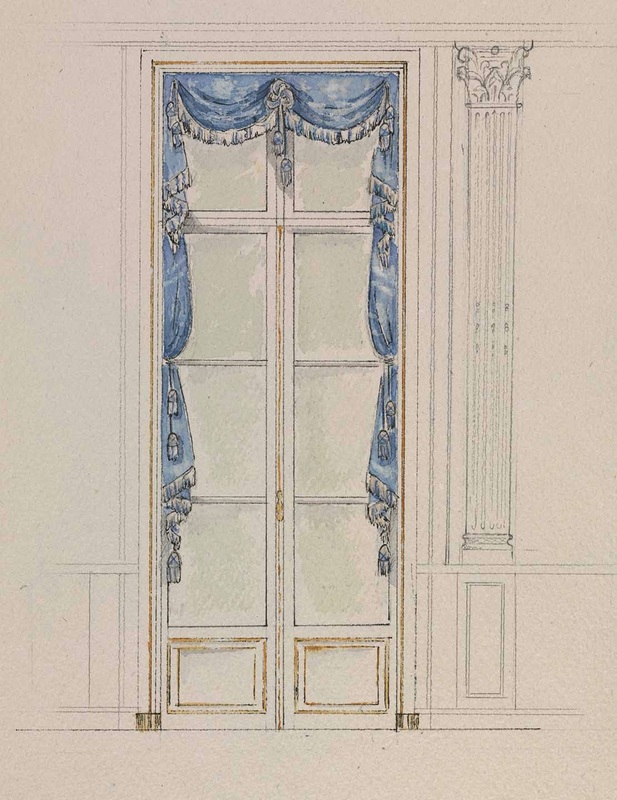 Perhaps most significant historic reconstruction is the historic arrangement of furnishings, based on a 1790 inventory at the Hôtel de La Trémoille. “Before the Revolution these salons de compagnie were, in fact, furnished principally with chairs,” says Chapman. A second set of sidechairs for the use of guests was arranged in a conversational “U” shape or circle in the middle of the room. Antiques dealer and designer Robert Garcia of Therien uses the period room as a tool for examining social history and wider applications in the decorative arts. 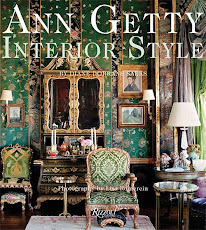 Garcia relates that as a young designer working for McMillen in New York he studied similar period rooms at the Met. 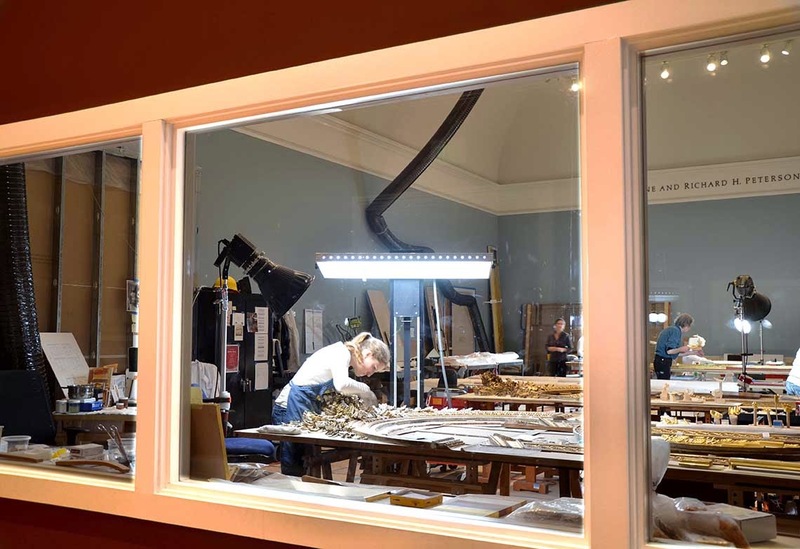 Period rooms, “…vividly make the past alive in a direct tactile and visual way,” says Charlotte Eyerman, Executive Director of the Monterey Museum of Art in a recent conversation. The period room in a museum presentation is not only a tool for academic study, but can have an aesthetic and emotional impact for the museum visitor– an evocative experience of stepping outside time. 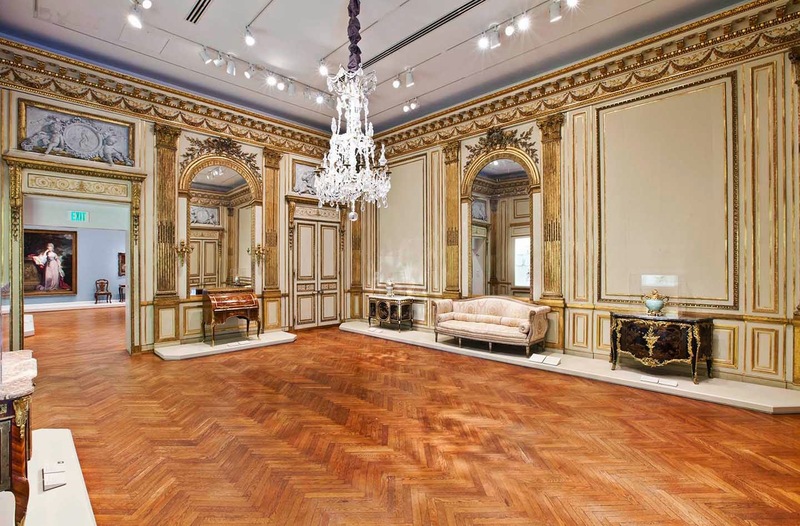 The Salon Doré has been moved no less than six times in its long history, crossing the Atlantic from Paris to New York, and then to California where it was donated to the Legion of Honor in 1959. In each move the Salon has endured various alterations. 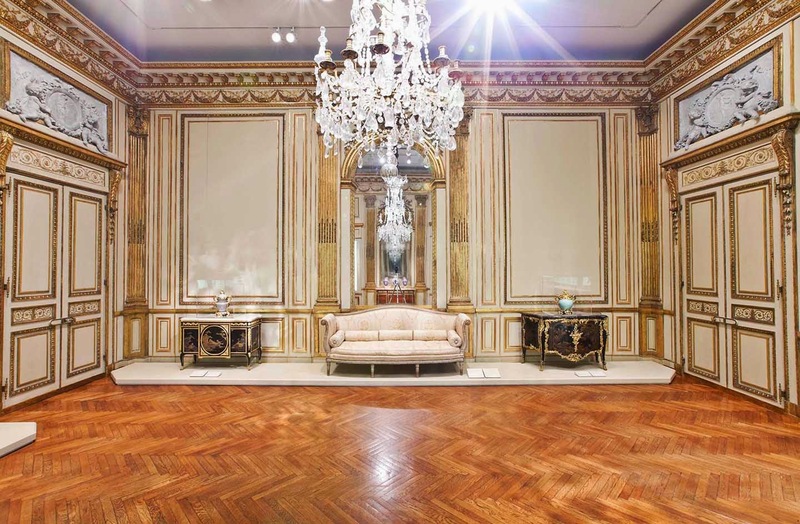 The format most visitors will remember from its earlier presentation at the Legion of Honor was of a rectangular form, cream painted with gilt, without its parquet floor or ceiling. Display cases had replaced the windows. Furnishings related to the period were isolated on plinths, rather than recreating the period environment. Martin Chapman describes earlier museum presentation of the Salon as a “paneled environment” rather than a “period room”, which at the time had seemed an outmoded term. These two images show how the room used to look at the museum. It was lovely...but not furnished properly and certain not planned and authentically put together. Compare the difference with the present glorious room. 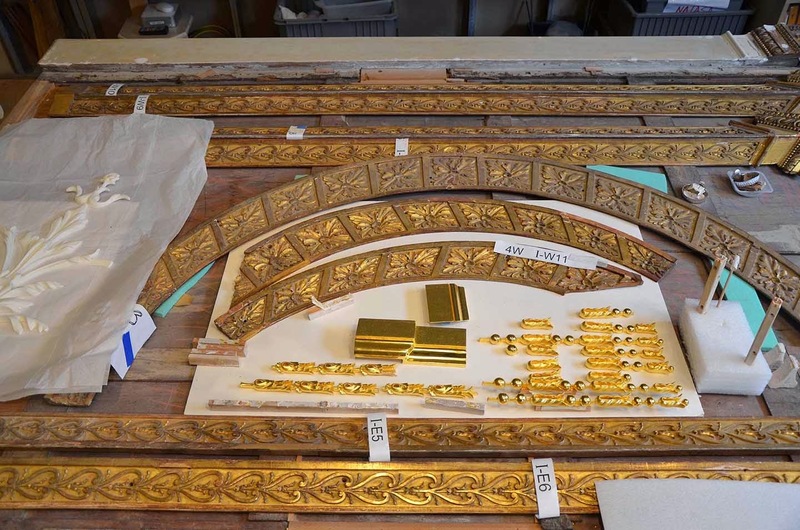 During the most recent de-installation, all the various parts of the Salon were carefully removed –the delicate plaster overdoors, the fragile mercury plate mirrors, the doors and the boiserie itself. 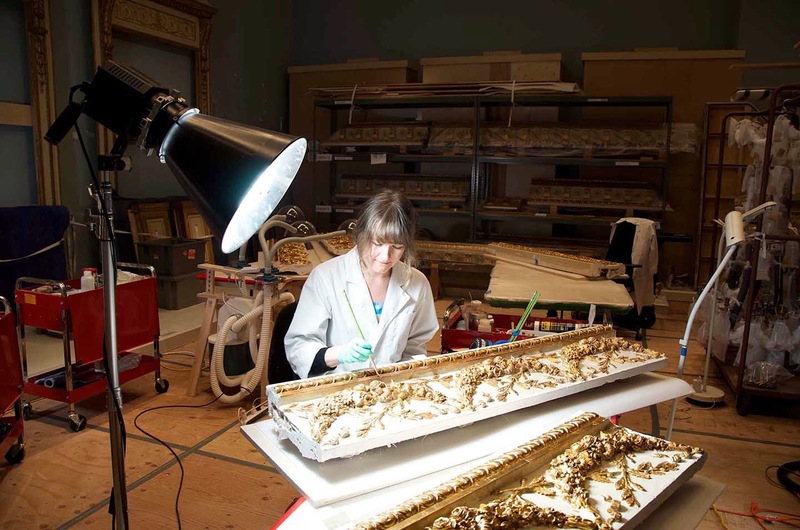 These various pieces of the Salon were then placed in a new conservation workshop, open to the Museum galleries though glass panels, so that the public could observe the meticulous conservation process. The dismantling revealed that in the course of its previous moves, the east and west walls had been switched. Additionally, notes written in French on the back of a mirror showed that at some point it had been switched from its original location. The de-installation proved to be the first part of the conservation process. This is how the original room at the museum, when it was first installed looked...nice but not thrilling. Visitors to the newly restored Salon Doré will first enter into an octagonal vestibule or anteroom before proceeding into the Salon Doré itself. This is a completely new construction designed by classically-trained San Francisco architect Andrew Skurman and his architectural studio. 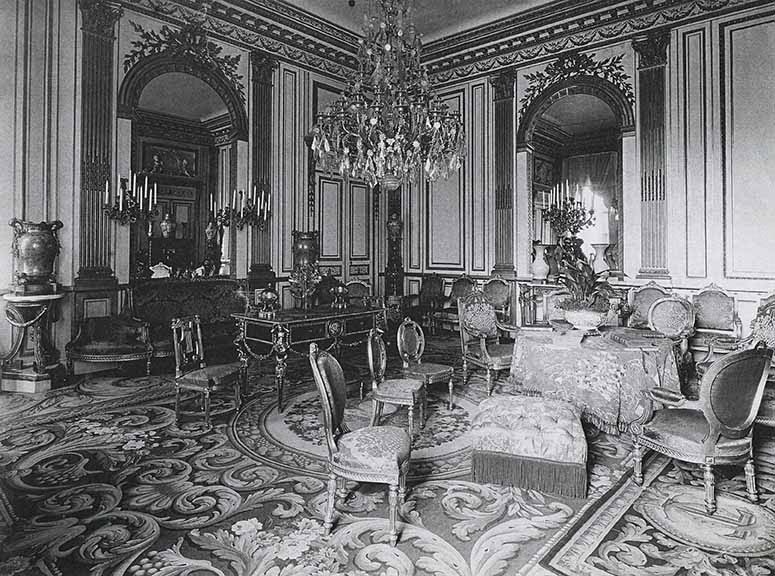 I volunteered to be the architect of the project, and to work in collaboration with Adolphus Andrews who led the effort, Martin Chapman who dedicated his huge knowledge to bring this room back to its exact 18th century state, and with the Parisian antique dealer Benjamin Steinitz, whose expertise came with gift of the actual parquet floor of the room. 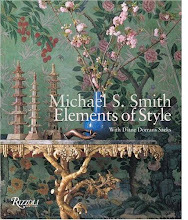 I went to study the Wrightsman rooms at the Met, and to the period rooms at the Getty, which are considered the top American models. And of course, each time I go to Paris, I visit one chateau of another, and always the Carnavalet Museum a delightful museum of period rooms. But in this case, the inspiration came from the curatorial staff at the Legion who devoted so much effort and found enough resources, to make to room identical to what it once was. “The new anteroom is based on the kind of shapes and room arrangements you would find in a classical building of this period” says Skurman. 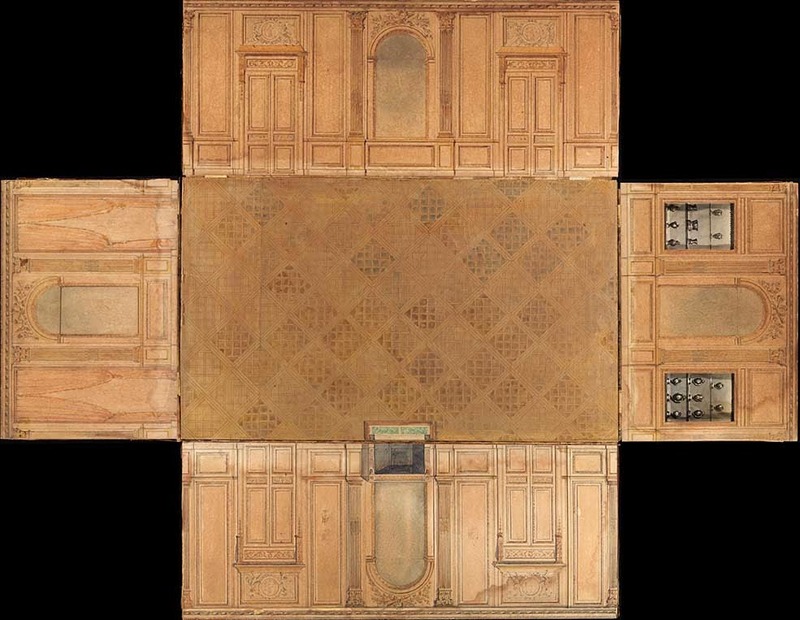 “The anteroom also provides the visitor with a sense of progression before one enters the Salon.” This replicates the hierarchy of space and sense of progression and arrival that guest would have had upon entering the Salon originally in 1781. 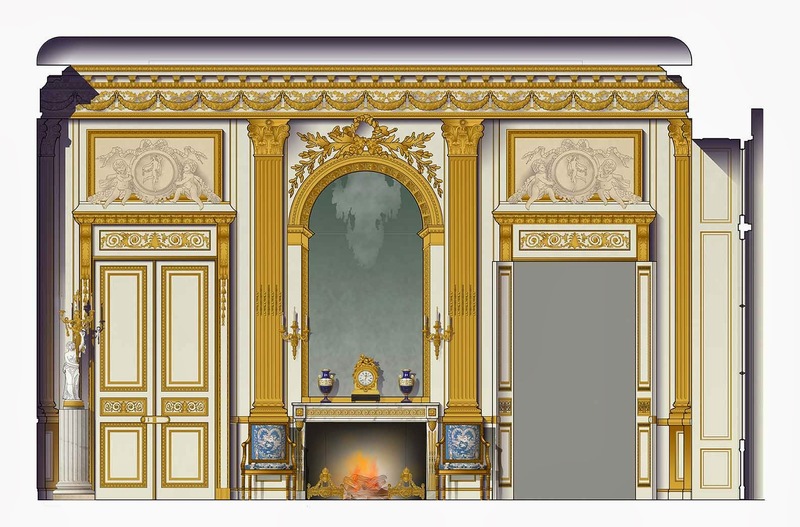 Skurman, an expert in classical French traditions and the recent recipient of France’s Medaille des Arts et des Lettres, donated his services in the design of numerous missing elements for the room. His considerable donation of talent, time and expertise was crucial for the restoration of various missing elements such as the windows and elements throughout such as the handsome plinths for the torchères. 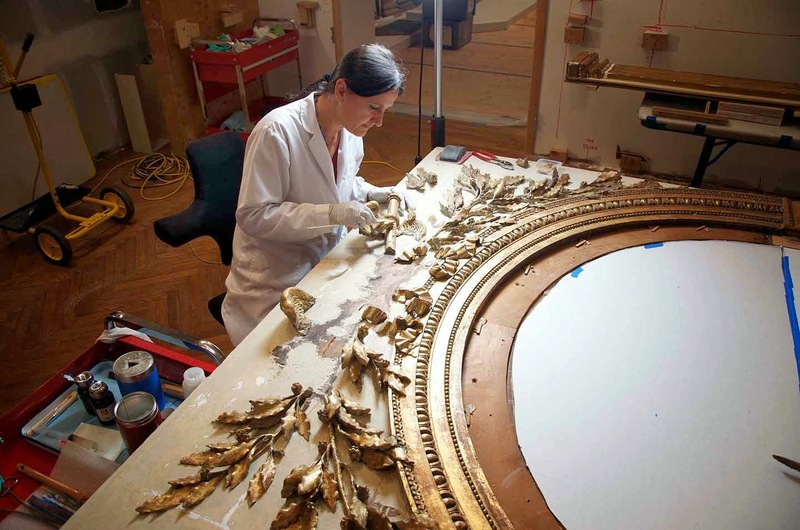 A team of gilders and conservators led by Natasa Morovic, conservator of frames and gilded surfaces at the Fine Arts Museums of San Francisco, led the gilding conservation effort, with assistance by contract conservator Deborah Bigelow. Too many talents worked on the project for us to list them here. 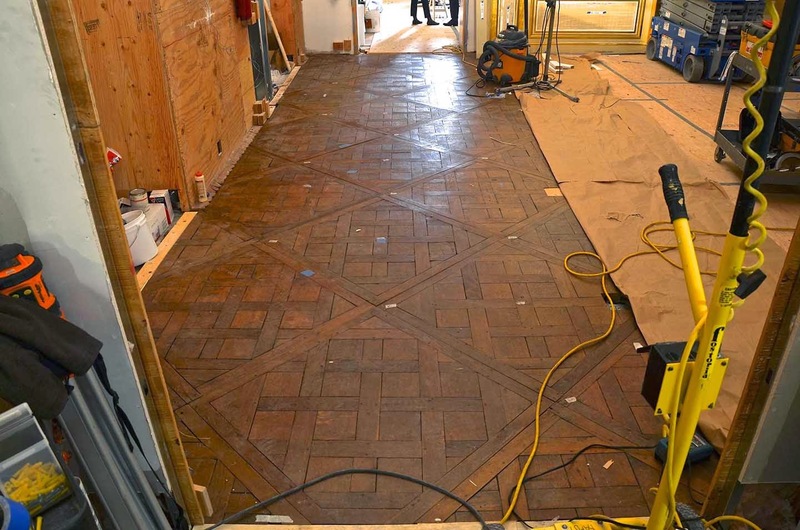 The intensive restoration of the panels was conducted in a temporary conservation lab, also designed by architect Andrew Skurman, which was installed in the museum galleries. 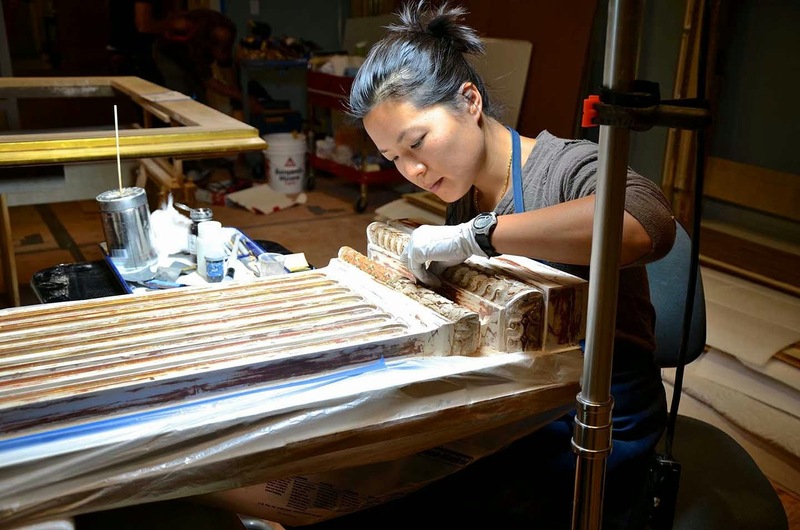 The treatment focused on returning the gilding to its original nuanced, high-quality execution. After intensive preparatory work, the gilders followed the traditional technique of water gilding as in the original 18th century execution. 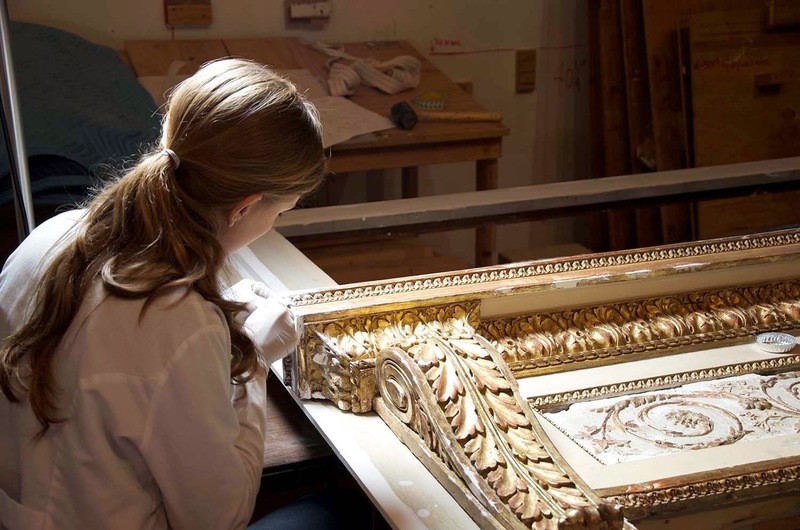 The process of toning was then applied through various techniques to achieve integration between old and new gilding – and to harmonize areas that are light and dark, and shiny and matte –throughout the entire paneling. Master carver Adam Thorpe (who had earlier created superb carving for Ann Getty) restored the wood details. Thorpe painstakingly removed old repairs to the carved sections and replaced them with new wood passages informed by the boiserie’s original design and perspective. 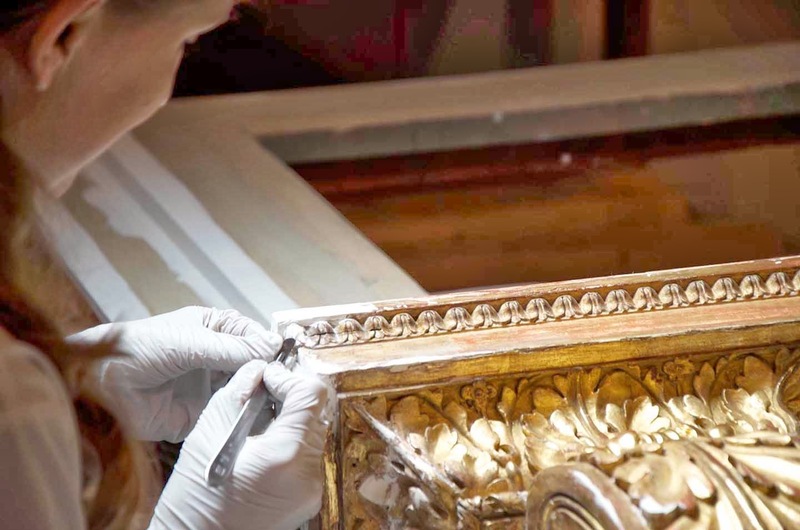 All of those involved in the conservation–from the team of conservators, gilders, master carver and painters –strove to duplicate as closely as possible the virtuosity and skills of the original craftsman of 1781. The techniques and materials employed were based on considered analysis and care. Bravo and thanks to everyone involved. Philip Bewley is a Fine Art Advisor for private individuals and corporate accounts, with services in the selection and acquisition of fine art and blue chip period antiques and 20th century design. Private portfolio management including fine art and the decorative arts. Philip was formally with Therien & Co. a top period antiques gallery. Philip is also licensed Realtor with First California Realty, specializing in distinctive properties in San Francisco and Southern Marin. Philip's portfolio of original fine art photography set at Secret Cove in the Marin Headlands was recently featured in Jonathan Rachman's Di Sini Di Sana magazine, and will be featured this spring in Matthew MacCaul Turner's room at the San Francisco's Decorator Showcase. Philip, thank you for this brilliant and rich report. Already, the museum has created a lively following for the Salon Doré and its restoration. The room was always at the museum, and was admired. Now, with the gilding on view, the process examined, the history revealed, the room reinvigorated. Thank you for your expertise, your passion and your knowledge. Martin Chapman, the curator who lead this extraordinary project at the Legion of Honor. 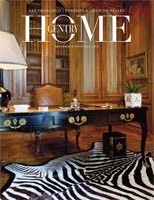 The excellent catalog for the room can be purchased at the Legion of Honor bookshop. 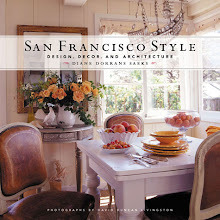 All images used here with express permission of the Fine Arts Museums of San Francisco. Plans and drawings courtesy Andrew Skurman Architects, San Francisco. What a thrill this has been, although it's too early in the morning for Champagne. I've often wondered how they re create these rooms and now, thanks to your wonderful reporting, I know. How fortunate that there are still craftsmen, like Adam Thorpe to work on these restorations. What a thrill to have this in San Francisco. Maybe I missed it but how was the room acquired? A massive and worthwhile undertaking -I can't wait to see it when I visit SF in June! 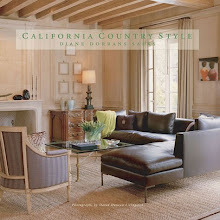 From this post forward I will picture myself seated in the salon Dore when I visit your pages. Thank you for the wealth of illustrations. I was delighted to be here in the company of Messrs. Bewley, Skurman, Chapman, and Thorpe. You perform your role as hostess flawlessly. In today's trends in museum exhibition, it seems that the period room had lost favor. But it is by far my favorite of all the tools that might be used in teaching the history of decorative arts, so I really appreciate the efforts that were put forth to restore this room. The way the room was used is also very interesting and an important educational factor as well. Excellent! Glorious Salon, glorious work, glorious post. I want to thank you and Phillip for this wonderfully detailed account. Especially impressive to me was that the public could view these master artisans at their restoration work! Thank you for inviting me to be a guest editor of The Style Saloniste -it has been an honor -and an extraordinary journey. Everyone is swooning over this first full report of the room--the workshop, the architecture, and the completed room. It was interesting to pull all the images together--and to have Philip paint a vivid portrait of what was involved and what it is like now. I see now that many people would never have had a sense of the room…as it had no atmosphere…before. Now it is furnished and vivid…and so many people contributed. 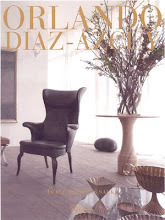 Thank you, Brillante Interiors for your kind words. John (The Devoted Classicist) - I am delighted to see you -I am a fan of your exceptional blog -and you get right to the heart of it -the "Period Room" had indeed lost favor, even the term "Period Room" was considered outdated, and there were questions of authenticity in the presentation, and museum de-accessioning period rooms from their collections. This restoration and refurbishment revitalizes the conceptual idea of such presentations, and excels not only in the meticulous research and conservation, but also in incorporation the social history of the room. It is a pleasure to read your insights. Thank you. 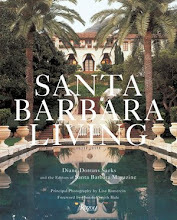 Beth Scanlon -that is so charming -that idea -and yes, I would like to imagine that as well -it would be a suitable setting to read and enjoy and especially discuss the ideas found in The Style Saloniste. Thank you. ArchitectDesign! I would love to hear your impressions of the room after your visit! I believe you will find it very inspiring. Hello Lindaraxa! You make an excellent point about the superior craftspeople such as Adam Thorpe -achieving virtuosity in his execution based on the original methods. 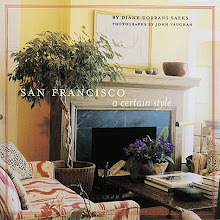 You had asked about when the Salon Dore was originally donated -after many moves -in Paris, then to New York and then at the estate, La Dolphine in Burlingame, the Salon was accepted as a gift by the Legion of Honor from Mr. Rheem and his wife in 1959 on the advice of the architectural historian John Harris. There had been a couple of incorrect attributions in provenance -and it was this most recent restoration where many exciting discoveries were made -as to the original Hotel or private mansion in Paris, the original paint, upholstery, room arrangement with furnishings and more - many journeys of discovery! I love seeing you all. It is a pleasure discussing this with you, -thank you. This is Philip's twin brother and I loved reading this post in the superb blog! How delighted I was to read your contributing post this morning. Thank you for sharing your passion and expertise for this extraordinary room. I particularly enjoyed hearing more about the history of the room and seeing the comparative images of the salon before and after. I imagine that the room has a much more intimate scale now that it has returned to its square form. The arrangement of furnishings also adds so much to the intimacy and the experience of how the salon would have been originally used. Do we know if the mantle is original? It will be one of my first things to see next time I am in the Bay Area. 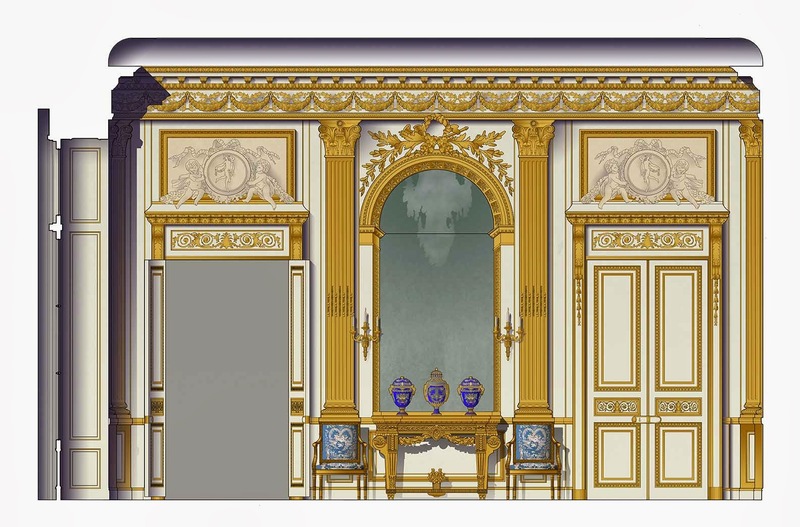 I did not know that it was originally designed for Madame du Barry. Coincidentally I just started a watercolor of Ledoux's Pavillon du Louvecienes, which is one of the finest and purest examples of French neoclassical architecture. 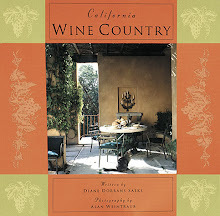 Thanks to you and Diane for another inspiring post! It is such a pleasure seeing your comment -and yes you are spot-on in your observations on the intimacy of the room now returned to its original configuration in shape and in furnishings ...and when seen in person -that struck me quite forcibly upon entering the salon -it is at once intimate and soaring. I believe the mantle is original -the very detailed catalogue does not say otherwise -(Michael, I highly recommend the catalogue) and it was immediately brought to the conservation lab in the de-installation. 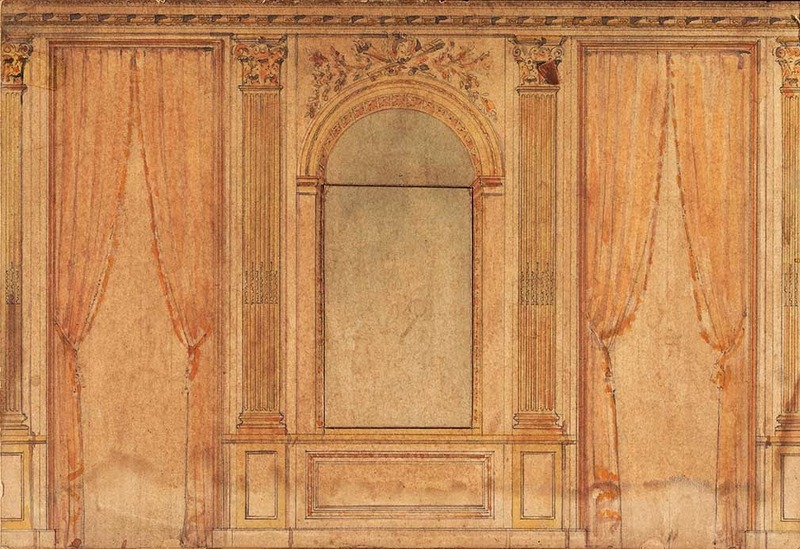 Interesting note -the console chosen for the room (not original to the room, but an outstanding example of the period -just right as the one described in the 1791 inventory) has a white marble top that is compatible with the marble of the mantle - a device expressly employed to achieve harmony in the French 18th century interior. Michael, I am a great fan or your original architectural watercolours -they are exceptional -and I look forward to seeing you watercolour of Ledoux's Pavillon du Louvecienes on your blog. I love looking at the MAGNIFICENT pieces ...so AMAZING !!!!!! I am completely overwhelmed and in awe of what I've just seen. What is most fascinating to me is the superb craftsmanship involved in an undertaking of this scale. I feel transported back in time to another century. Thank you for the beautiful trip! I've had so many great great comments on this post--and lots on FACEBOOK.